Then Tracey Evans, an abolitionist in Australia, befriended Whitaker through correspondence and came to manage the site and a Facebook page and to coordinate volunteers. Meanwhile Dina Milito, a victim of violent assault seeking to understand violence, connected with Whitaker, who seemed to be pursuing the same questions. Her correspondence with him and other condemned people proved reparative to her, and she became an opponent of capital punishment. Eventually Whitaker asked Milito to edit the entries and to recruit other writers. The volunteers, including me, who read over a thousand entries to PEN’s annual Prison Writing contest have witnessed in writers the transformative power of winning a prize. Many experience themselves anew as valuable human beings, and some glimpse a meaningful future. Several then write for their own sakes, as if their lives depend on it—and in a real sense they do. Others hunger for readers. Years ago the Prison Writing Program fed some of that hunger with the publication of Doing Time: 25 Years of Prison Writing, a PEN American Center Prize Anthology (now back in print with Arcade Publishing). Several contributors went on to publish elsewhere, but it’s never easy. Last year Michael Wayne Hunter, whose story “Sam” in Doing Time recounts a remarkable relationship between a white prisoner and a black guard, wrote me that his work was being posted on Minutes Before Six. Seven of the fourteen writers on the site turn out to be winners of the PEN prison contest. (Whitaker took PEN’s first prize in the essay in 2011 for “Hell’s Kitchen”). They write about the arcane life inside or in the streets, and about capital punishment. The site also includes information about abolitionist organizations. Minutes Before Six has expanded to include essays, poems, and artwork from writers in California, Washington, Virginia, and Florida, most, but not all, on death row. Although ironically the writers cannot read it online, the blog has become a writing community. 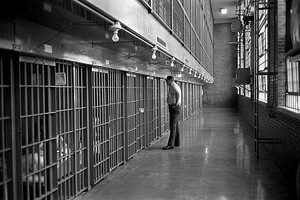 A series of essays supporting Proposition 34, a California ballot initiative to repeal the death penalty and replace it with the sentence of life without the possibility of parole, inspired three submissions from new writers on death row there. Milito sometimes stimulates a series, for example, sending a piece on death watch to Christi Buchanan, who had kept watch on her husband’s execution. Buchanan had also won second place in PEN’s memoir contest in 2011 for a piece about giving up her newborn baby in jail. Both Buchanan’s powerful pieces center on the solidarity of women in prison.